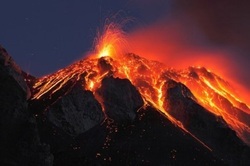 Study: volcanic eruptions diminished recent warming. March 3, 2013. Average global temperatures fluctuate in response to many different influences, and while some of these "forcings" are now affected by humans, others are shaped entirely by natural causes. Articles on this website have considered whether sulfur released into the atmosphere by volcanic eruptions stimulated the prolonged cooling of the so-called Little Ice Age in the centuries before 1850. Deposited in the stratosphere, volcanic sulfur dioxide interacts with other chemicals to form sulfuric acid and water, which in turn reflects solar radiation. Other articles on the site have introduced research revealing that the reflective properties of man made aerosol pollution in the twentieth century likely sheltered swaths of North America and, later, parts of China from the influence of global warming. Published in the journal Geophysical Research Letters, a new study by lead author Ryan Neely explores how these very different influences have recently interacted with the most important forcing agent of our time: the rapid rise of atmospheric greenhouse gases caused by human activity. In recent years extreme weather influenced by a warming climate has caused unprecedented devastation and awakened millions to the reality of anthropogenic global warming. The decade between 2000 and 2010 was the warmest in the instrumental record. However, the rise in average global temperatures actually stagnated during those years, even as greenhouse gases continued to accumulate in the world's atmosphere. Not surprisingly, the unexpected hiatus in warming stimulated vigorous debate among climatologists and opened avenues of attack for global warming deniers, even as concrete answers remained elusive. Atypical decades out of sync with the general climatic trend are hardly unusual, and some climatologists attributed the moderation of warming to the kind of random variability that can affect any complex system. However, others argued that their colleagues had underestimated the influence of rising aerosol pollution in the developing world or, alternatively, that the influence of recent volcanoes had been ignored. Neely and his co-authors used a global climate model and an aerosol microphysical model to measure the influence of both aerosol pollution and the the sulfur emissions of small to moderate volcanic eruptions. Until recently only catastrophic volcanic eruptions were believed to trigger significant cooling, yet satellite observations presented in the paper reveal that even volcanoes releasing less than a million tons of sulfur dioxide into the lower stratosphere can still cool global temperatures. When model results were compared with satellite observations the results suggested that volcanoes, not human pollutants, were responsible for a temporary stagnation in global temperatures. Media reports have claimed that the results "exonerate" the developing world, although of course cooling caused by atmospheric aerosols actually shielded us from the full force of a warmer climate. By shifting our focus from major volcanic eruptions to their smaller cousins, the conclusions published by Neely and his co-authors have the potential to transform how we consider the climatic variability of the past. They also offer a reminder that climate changes through the interaction of many different influences, some caused by humans, others affected by humans, and some that are entirely out of our hands. It is that complexity, still poorly understood, that can cause our climate to behave in ways that we do not always expect. Scholars of climates past, present and future must find ways to communicate some of this complexity to a broader public, so that broader attitudes towards global warming stop fluctuating in response to every cold winter or hot summer.